Over the years, I have been fortunate to have styled and coloured hair for some wonderful clients, many of whom I have got to know well. We have frequently shared life’s highs and lows. For some those lows have involved courageous battles with cancer and inevitably, the side effects of chemotherapy, resulting in hair loss and baldness. The post-chemotherapy phase during hair growth can be very challenging, and of course there is usually a gruelling schedule of hospital appointments. While NHS wigs are available, this can be a clinical, impersonal service, feeling more like a hospital appointment. Ladies in particular feel they have lost their femininity and long for that ‘hair salon’ pampering experience. Baldness and hair loss are not just linked to chemotherapy. They are conditions that can occur naturally through Alopecia, or as a common side effect of prescriptive drugs. 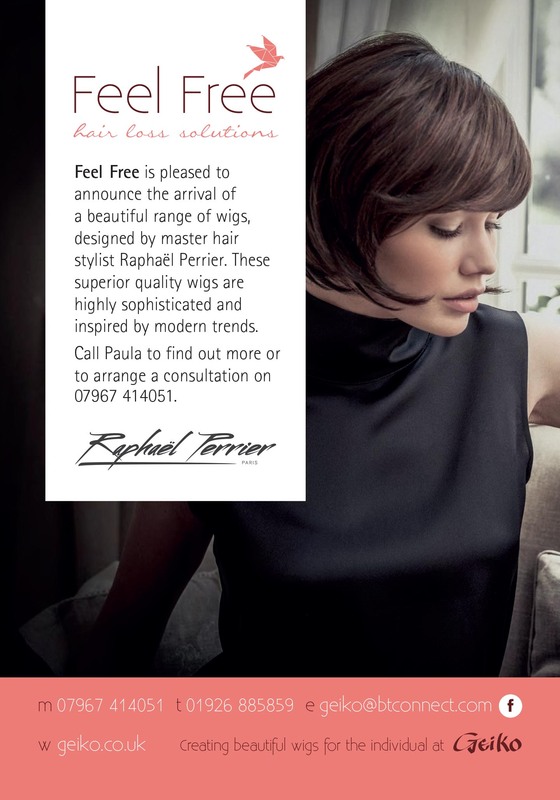 Listening to clients in this situation has touched a chord and has been the inspiration for launching Feel Free Hair Loss Solutions – a luxurious, ‘bespoke’ in-salon service providing beautiful natural looking wigs and hair pieces, styled and coloured for the individual, for both ladies and gents. Feel Free is about escapism, a pampering time. It makes choosing, styling and maintaining your wig or hair piece just like a normal salon experience to boost confidence and self-esteem. We offer the best quality real and synthetic wigs with ‘off-the-peg’ and custom-made options that have ultra-light, breathable bases. We also use the fabulous Postiche Lite Volumiser hair pieces for hair thinning or pattern baldness conditions. I personally provide salon consultations (at Geiko) as well as measuring, fitting, styling and colouring services. I review your skin tone, facial shape, your lifestyle and personality. There isn’t any rush, or pressure and I will offer all the help and guidance you need. You can come to Geiko in normal salon hours or make a private ‘Sunday’ appointment. Once I have fitted your wig, I show you how to care for it and supply you with any specialist products. Just like any regular hair appointment, you would normally return within 4–6 weeks for a follow-up session, where I remove, check and clean your scalp before re-applying your wig. Our wigs and hair pieces are simply beautiful and I promise, if we shed a tear or two, it will be out of happiness as you have the opportunity to feel free again.